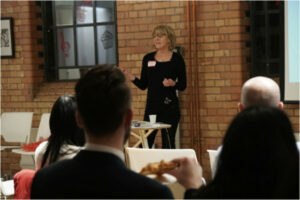 At this month’s Marketing Meetup: Birmingham we heard from the brilliant Bron Eames. Bron has over 30 years’ experience in public relations having worked in-house and in consultancy. She is currently chair of PRCA Midlands and has also chaired the CIPR in the Midlands – and spent four years on the national PRCA board of management. We’re pretty sure she knows her stuff!! In Bron’s talk, she gave us some great examples of when big brands haven’t planned for a crisis and how others that have taken responsibility and owned their mistakes. In a world where we have so many channels and our brands are so visible, there is nowhere to hide. However, we should be celebrating this by being proactive and making ourselves visible in a positive honest way and doing the right thing. Carry out a full risk assessment/communications audit. Have a plan! Be authentic – take the pub test! Have a proper CSR strategy – or should that be SR? Have a great comms team who love their job! Inflict ‘help’ in the name of CSR – like painting fences no one needs! Ignore employee preferences. Millennial stats! The main takeaway for me was that Bron encouraged brands to be transparent, decent but above all, be fierce!